University of Wisconsin athletic director Barry Alvarez has signed a contract extension with the school that runs through January 31, 2021. 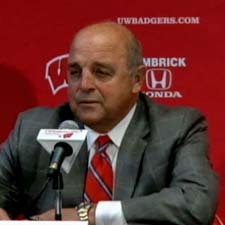 Alvarez has served as Wisconsin’s director of athletics since 2004. He turns 70 on December 30. According to the University, the extension went into effect on Sept. 1 and came after a performance review by UW Chancellor Rebecca Blank. Wisconsin has captured 56 Big Ten titles and 14 National Championships during his run as athletic director. Three of Wisconsin’s fall sports (football, volleyball and men’s cross country) are currently ranked in the top 10 nationally.